How to draw Nara Shikamaru from Naruto Manga. Shikamaru Nara, 奈良シカマル, is a major supporting character of the series. He is a chūnin-level shinobi of Konohagakure’s Nara clan and a member of Team Asuma. Along with his team-mates, he makes up the new generation of Ino–Shika–Chō, just like their fathers were before them. Learn how to draw Nara Shikamaru from Naruto step by step basic Manga drawing lesson. Learn basic drawing and sketching technique for Manga, Anime and comics from TheArtClasses.com In this tutorial you will learn to draw an Manga character Nara Shikamaru along with basic drawing tips and technique. First, you can use simple geometry shapes to construct the basic Manga head and body. It will make your drawing process a lot easier once you get the shape and proportion right. No matter what you are trying to draw, once you understand its foundation. In this one, you will also learn foreshortening action post from the drawing. Drawing tips, you have to make sure the shape of eyes, nose and mouth are correct. Not only the shapes, but also the placement of eys, nose and mouth. It will make your drawing process a lot easier once you observe the over all shape of the character you are trying to draw. I usually start of using sphere or circle as a base for character’s head shape, then next step would be figuring out the next shape that suit the image. Nara Shikamaru was the sort of unenthusiastic kid who liked to watch clouds. He preferred not to get involved in “troublesome” activities, pretending to be busy to avoid responsibility. He also does not like fighting, deeming it, as he does most things, “troublesome”. He is fully aware of this side of his personality. He even named himself “the number one at running away” or “the number one coward”. However, when duty calls, Shikamaru has a strong moral compass and sense of commitment towards his comrades. Even though, by his own testimony, he lacks bravery, he will sacrifice himself and face almost certain death, for the sake of his friends and/or villagers without a second thought. Because of his raw leadership skill, he was the first genin from the Rookie Nine to become a chūnin. Here is a final drawing of Nara Shikamaru. 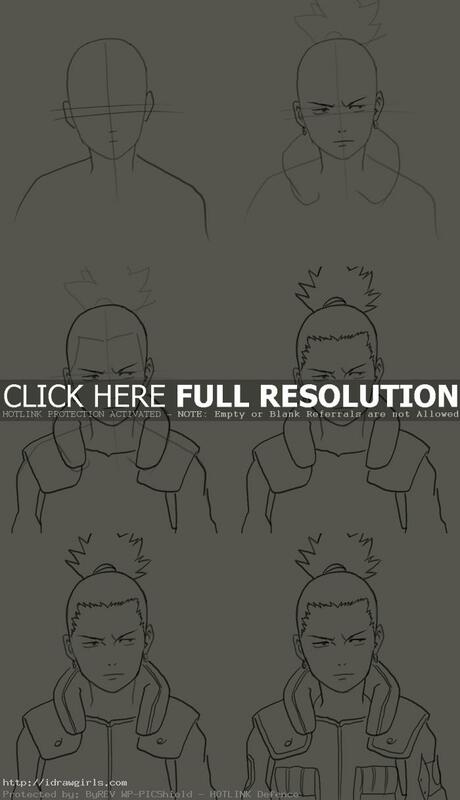 Below are step by step images how to draw Nara Shikamaru. Step one, I sketch very loosely his facial feature and guidelines. Step two, I then drew his eyes, nose, and mouth along the guidelines. Then I drew his ears and hair style roughly. Step three, I sketched out his costume. Step four, I refined his hair. Step five, I finished up his costume then clean up the rest of the face. Step six, I finished up the rest of the drawing. wow this is great! can you please make a tutorial on Kazekage Gaara no Sabaku?